Rockstar continues to keep us sitting at attention by releasing two new pieces of artwork for their upcoming Grand Theft Auto V, which nobody knows about or is looking forward to. At all. The two images are intended to grace your desktop and show off, what we can only assume, is just another day in Los Santos. 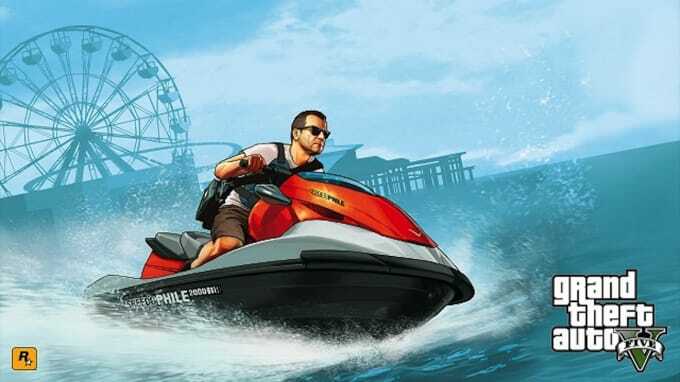 Two of our three main characters are seen riding both a jet-ski and a dirt bike armed to the teeth, police in hot pursuit. These desktop pieces come after Rockstar has released a new batch of screenshots and the game&apos;s official box art. Head over to Rockstar’s official site to ge the pieces for yourself. Well, what do you think? Let us know. Grand Theft Auto V is set to drop September 17 for Xbox 360 and PlayStation 3.